Enderle Horse Property - Elgin, Santa County, AZ - Headquarters West Ltd. This 196-acre property is located in Elgin, AZ. Elgin is a small rural town in southern Arizona and is often linked to the neighboring town of Sonoita. At just under 5,000’ in elevation, the region is considered a high, desert grasslands. Historically run as ranchland, with cattle ranching still the major local industry, the Sonoita/Elgin area has also developed into one of Arizona’s prime wine producing locations. The local vineyards are active and draw tourists for wine tasting tours and festivals throughout the year. 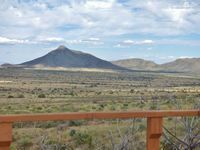 With Tucson located approximately 40 miles northeast of the main intersection, the Sonoita/Elgin area has drawn retired professionals and commuters to the community seeking the relaxed, rural lifestyle not available in the city. Tucson is the second largest city in Arizona and offers easy access to major medical services, the University of Arizona, Tucson International Airport, museums, Davis-Monthan Airbase, shopping, and a variety of entertainment and restaurant options. 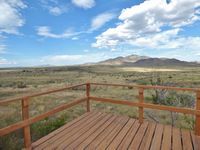 The property is also situated just 20 miles from Sierra Vista and U.S. Army Fort Huachuca. Southeastern Arizona is a region steeped in history and western lore – from the famous shootout between the Earps and Cowboys at the OK Corral in Tombstone, to the conflicts with the Apaches, including Cochise and Geronimo, which flowed into the surrounding mountain ranges. The area is also rich with natural wonders, including Cochise Stronghold; Texas Canyon; multiple mountain ranges; and Kartchner Caverns, a spectacular living cave. With a mild climate, the area offers year round opportunities for a variety of outdoor activities including horseback riding, hiking, bicycle riding, motorcycling, and more. The average high temperature in Elgin reaches the low 90’s in June, with mornings in the 60’s. The average low temperature drops to the low 30’s in January, but the afternoons warm to the 50’s and low 60’s. The average rainfall in the area is around 12 to 15 inches, with most of the moisture coming during the monsoon season, typically lasting from early July to mid-September. Morning clouds build to beautiful afternoon/evening storms. 196 dividable acres, with a three bedroom, two bath, 3,049 square foot custom home, constructed in 1975. The home was designed as two separate areas, the living space and the separate bedroom/bath area, connected by a suspended hall. Spacious living and family rooms flank the kitchen, dining room, and a covered porch. A large fireplace in the living room is constructed of blocks cut from unique white stone with exposed fossils on the faces. The bedrooms are roomy and there are multiple closets flanking the hallway offering abundant storage space. A laundry room, with attached porch, is located in the bedroom wing and includes a large utility sink. Additional storage is located beneath the house. Located next to the house is a detached two car garage constructed with extra space that could be enclosed to create a shop or guest apartment. Included on the property is a small adobe building, referred to as the ‘Salt House’. With its beautiful background and southwestern construction, this building is even rumored to have graced the pages of Arizona Highways magazine. 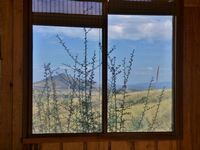 What makes this property truly special are the unobstructed views of the open valley and surrounding mountain ranges. 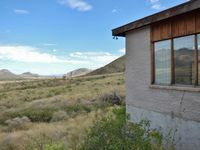 With roughly a 400-foot climb from the highway entrance to the home site, this is the highest set home on the north side of the Mustang Mountains, directly under what the locals refer to as ‘the Little Biscuit’. State land abuts almost 2/3 of the property’s border and a crest of the hill to the west blocks any view of the neighboring home site, providing privacy and solitude. Constructed from neutral colored blocks, the home was built to last and, except for the presence of the Italian Cypress, the home almost blends into the hillside. This property offers the opportunity to invest in a large parcel of dividable land with highway frontage and bordering open state land. The lower portion would be suitable for many uses such as horse facilities, guest housing, or possibly even a vineyard. In the past, the property included a runway for take-off and landing of ultralight aircraft. The home has not been updated since the original build and is being sold AS-IS. This is reflected in the purchase price. The home is all electric, and the property includes a private well with a 4,000 gallon steel storage tank and septic system. The Santa Cruz County zoning for the property is RU-4. The property is being leased by a neighboring rancher and is currently under agricultural tax grazing status. 2014 Taxes - $3949.04.